Whether you’ve got a case of the winter blahs or are simply want to shake up your style, statement earrings are one of the best ways to put a little pep in your step—and your wardrobe. Plus, they’re affordable and don’t need to get packed away as soon as the snow melts in March. What’s not to love? The key to wearing these big-personality earrings is to style them thoughtfully. They’re fabulous with everything, sure, but the right top can really make them sing—not to mention turn every head in the room. Here, five combinations we love. Try one or two on for size and don’t be surprised if winter just flies right on by. These bold drop earrings are the chicest exclamation point on every outfit. We especially love them with our navy one-shoulder top for a ladylike look that’s perfect for bridal showers and graduation parties. Try the combo with a slim, cropped pant or full midi skirt and heels to really achieve the Carrie Bradshaw effect. Gold hoop earrings can go from minimalist to maximalist, rock ‘n’ roll to glam, depending on how you style them. That’s partially why they never go out of style. The other reason? They’re h-o-t any way you slice it. This spring we’re feeling the staple with Western-style shirts for a look that calls to mind the best of an urban-cowgirl trend mashup. More of a down-to-earth dresser? 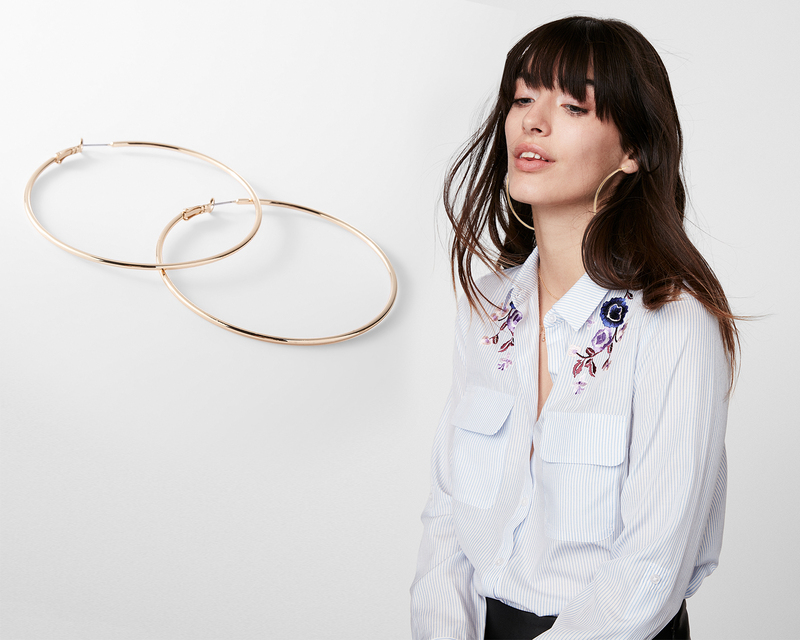 Our tortoise shell hoop earrings and a white tee make a dramatic statement without coming on too strong. The look is perfect for a laid-back locale like LA or if you count ‘70s-era Jane Birkin as a style icon. Just add high-rise jeans, sandals, and messy hair to complete the look. A vintage car wouldn’t be the worst thing in the world either. Got a big night out? Whether it’s bachelorette party, birthday bash, or just a fun night under the disco ball, sometimes you want to turn up the volume on your look. Big rhinestone earrings make every outfit more fabulous. Give them “Dynasty”-level glamour with an over-the-top going-out top in bold-color velvet or satin. Whether you’re vacationing in Marrakesh or just crave some color in your wardrobe, our red tassel earrings add a vibrant feel to every outfit. 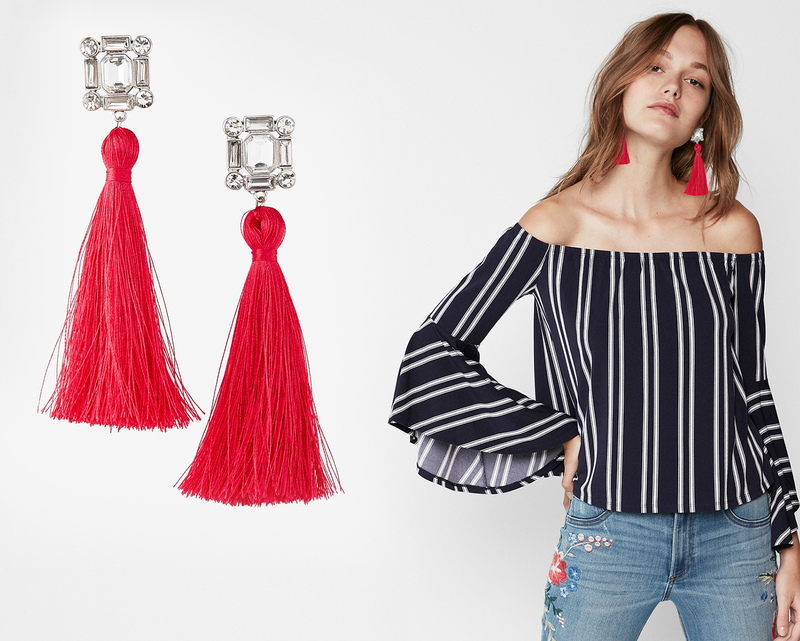 They look beautiful with a LBD but we especially love them with a dramatic-sleeve top in a bold striped pattern for an editorial look that’s begging for a selfie in Le Souk.